Silver River Basement Systems is your local, certified Total Basement Finishing (TBF) contractor. 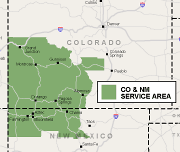 Silver River Basement Systems proudly serves the Colorado & New Mexico area, including Aztec, Montrose, Canon City, Espanola and many areas nearby. Call or e-mail us today for a free basement finishing quote!